The timbered home that houses this family-owned estate in Hainfeld was built in 1619. 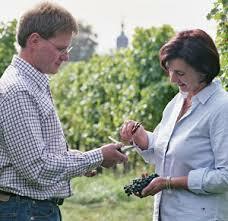 In 1990 Annette Borell and Thomas Diehl married and created Borell-Diehl. Their 33 hectares of vineyards are a complex geology of loess, limestone, red sandstone, and lots of minerally muschelkalk (limestone). Rigorous crop thinning and hand harvesting are the norm here. A cool, under-the-radar source for bargain Riesling, Müller-Thurgau, Gewürztraminer, Chardonnay… and recently Pinot Noir!